I pledge to talk with my local businesses about items I cannot find, and understand I can order from our community stores to fill the majority of my needs. I pledge to know what my community offers. I will get to know my businesses, do a little digging, take a walk down Main Street, and participate in local events to make relationships. I pledge to acknowledge without Lodi's small local businesses, our schools, infrastructure, job market, organizations, and town as a whole cannot thrive! I pledge to have a great time doing business with someone I can trust. Lodi's small business owners are your friends and neighbors, and employ the people you see every day. They know they have a responsibility to the community. You can rest easy knowing you have real, meaningful, relationships with these people. I pledge to be a part of something BIGGER! By keeping my business in Lodi I am supporting The American Dream! Someone's passion! 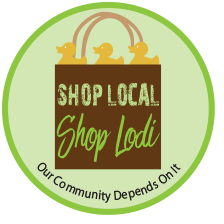 I am supporting my entire community by choosing to keep my business in Lodi.